Update: It looks as though Nokia Lumia 1020 pre-orders are opening in the UK on September 12, with the handset scheduled for delivery on September 24. At least, that's the word from Three which has opened its pre-orders for the device now with various tariffs available. The 64GB model will be available only through O2. It's official: the Nokia Lumia 1020 will touch down in the UK on September 12 bringing its huge 41MP snapper to the British masses. The Lumia 1020 release date was confirmed on the Nokia UK twitter page in a simple message which reads "#Lumia1020 + UK = this Thursday" - because maths is a great way to say when a phone goes on sale. When prompted by other Twitter users for more information Nokia candidly replied "you'll know all about the what/when/where on Thursday", which isn't overly helpful. Luckily for you here at TechRadar we've done the hard graft to discover who will actually be selling the Nokia Lumia 1020. Previously some retail sites suggested we may get hold of the Lumia 1020 at the start of September, but that's clearly not the case. Is Nokia looking to steal a bit of Apple's thunder with the timing of this release? Probably not. As well as that massive camera the Lumia 1020 also sports 4.5-inch display, 1.5GHz dual-core processor, 2GB of RAM, 32GB internal storage, 2000mAh battery and comes running Windows Phone 8. 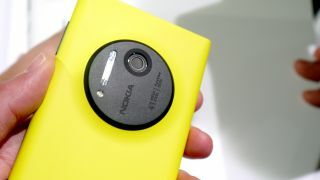 Nokia Lumia 1020 release date: Where can I get it?